Even as the bells rang out the transition from the Twentieth to the Twenty-First Century, it was clear to many of us that the assumptions on which we had planned our lives were beginning to unravel. Prominent among these assumptions was the idea, at times explicitly stated, and at others casually taken for granted, that each succeeding generation could expect to be "better off" (this was rarely defined with any precision) than those that came before. In the early hours of 1st January 2000, as I sipped my champagne at the University of Greenwich, where I then taught, and as, on the island of Jersey, my father lay dying, I reflected that this promise had, in so many ways, been realised. I had been born with a greater life expectancy than my parents; I have enjoyed educational opportunities that were not available to them; I have traveled more widely than they ever did; consumer credit has made it easier for me to have what I wanted; and I have never had to live through a world war. As the first decade of the new century unfolded, however, the costs attached to this promise became more and more apparent. The technologies that had assisted my career as an academic and writer created just as many new opportunities for criminals and terrorists; increasing life expectancies created challenges around the affordability of health and social care; and our greater mobility around the world, coupled with advances in broadcast and social media, laid bare the inequalities that, for decades, had been all to easy to ignore. The terrorist outrages of September 2001, in the United States, were followed, in July 2005, by a series of attacks on London, the perpetrators, in this instance, our fellow citizens. A series of banking failures in 2007-2008 precipitated a recession on a scale that few of us had ever expected to live through, and which, for many of us, evoked memories of the Great Depression that had blighted the lives of our grandparents and great-grandparents. The hopes that we had toasted at midnight in Greenwich, only a few years earlier, seemed distant indeed; and these events and circumstances have shaped the age in which we now live. We have assuredly not reached "the end of history," not that I have ever entertained that particular dream. 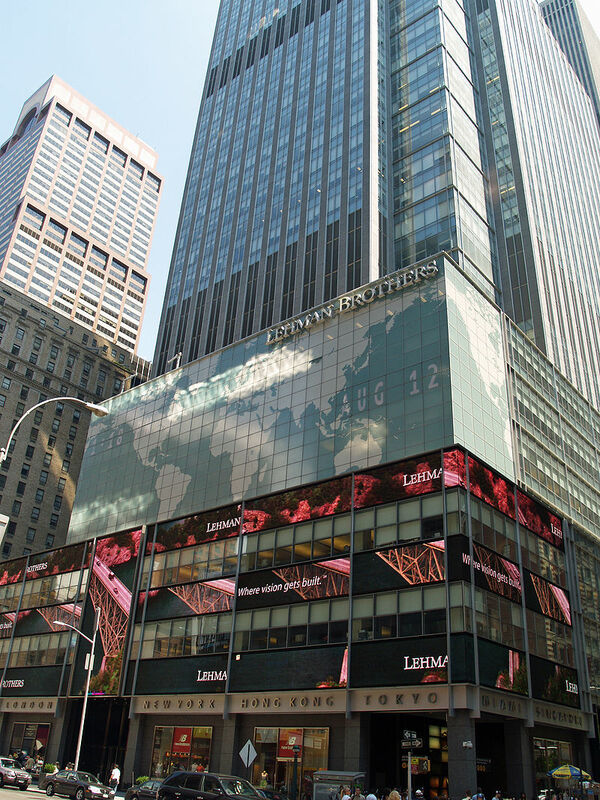 The New York headquarters of Lehman Brothers, the bank whose collapse in September 2008 sparked the global financial crisis. Photo: David Shankbone (licensed under GNU). GDP map for 2009 - countries shaded red or brown were in recession. Photo: CIA (image is in the Public Domain). 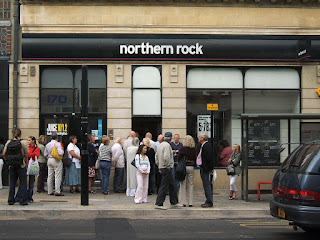 Queues outside Northern Rock in Brighton ("runs" on banks had not been experienced in Europe since before the Second World War). Photo: Dominic Alves (licensed under CCA). 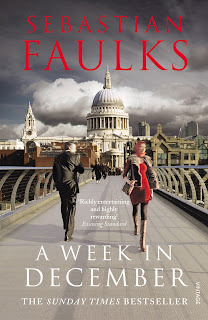 Sebastian Faulks's novel, A Week in December, is a work of contemporary fiction researched and written by an author better known for his historical novels. It is set in London at the time of the financial crisis, with a cast that includes financial speculators; people variously addicted to drugs, virtual internet worlds, and "reality" television shows; train drivers; lawyers; professional footballers; Muslim immigrants who have fulfilled their dreams of business success; and radicalised youths whose own dreams have little connection to reality, but every potential to destroy the dreams and hopes of their neighbours. It is a work of Dickensian scope, a portrait of a city, and of a country, in flux. 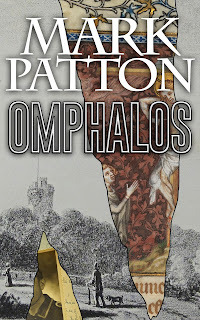 Its protagonists, among whom most of us can, I suspect, identify ourselves, do not know how things will work out, but the novel will, I am sure, be discussed by those who will look back on our age with the benefits of historical hindsight. "Five o'clock and freezing. 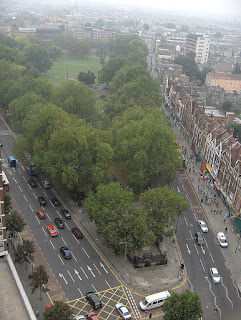 Piledrivers and jackhammers were blasting into the wasteland by the side of West Cross Road in Shepherd's Bush. With a bare ten months to the scheduled opening of Europe's largest urban shopping centre, the sand-covered site was showing only skeletal girders and joists under red cranes, though a peppermint facade had already been tacked on to the eastward side. This was not a retail park with trees and benches, but a compression of trade in a city centre, in which migrant labour was paid by foreign capital to squeeze out layers of profit from any Londoner with credit." 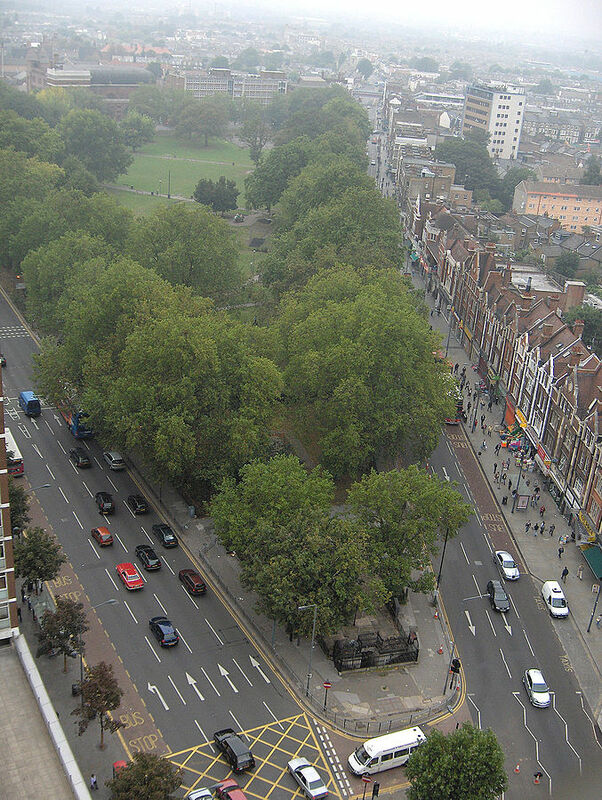 Shepherd's Bush Green. Photo: HTUK (image is in the Public Domain). "In his small rooms in Chelsea, Gabriel Northwood, a barrister in his middle thirties, was reading the Koran, and shivering. He practised civil law, when he practised anything at all ... For a long time, and for reasons he didn't understand, Gabriel had received no instructions from solicitors ... Then a case had landed in his lap. 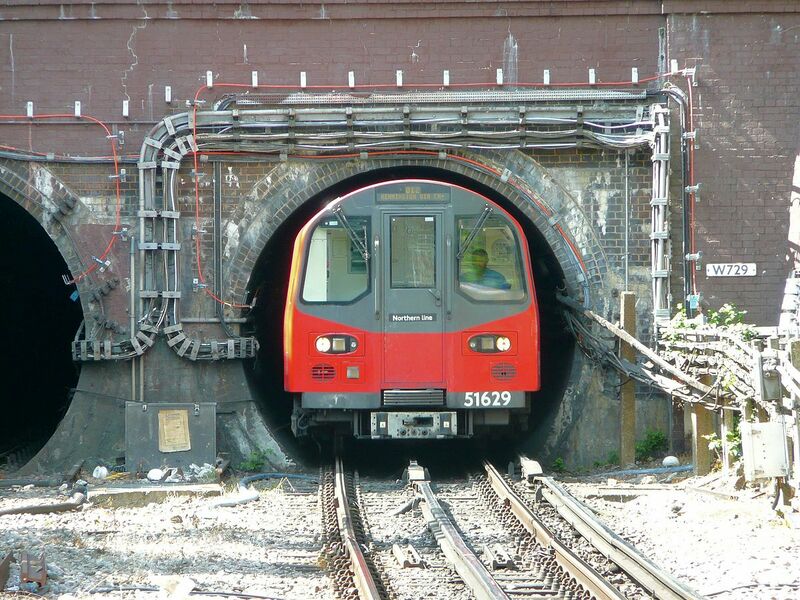 It was to do with a man who had thrown himself under a Tube train, and the extent to which the transport provider might be deemed responsible for failing to provide adequate safety precautions." "Some yards below where Gabriel sat reading was an Underground train; and in the driver's cab a young woman called Jenni Fortune switched off the interior light because she was distracted by her own reflection in the windscreen. She slowed the train with her left hand on the traction brake control and, just before she drew level with the signal, brought it to a halt. She pressed two red buttons to open the doors and fixed her eyes on the wing mirror to watch the passengers behind her getting in and out." 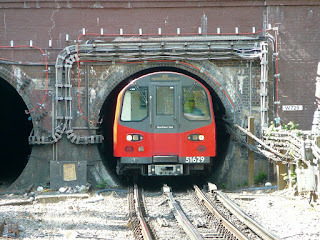 The London Underground. Photo: SPSmiles (image is in the Public Domain). "In the rear compartment of Jenni Fortune's Circle Line train Hassan al-Rashid sat staring straight ahead. 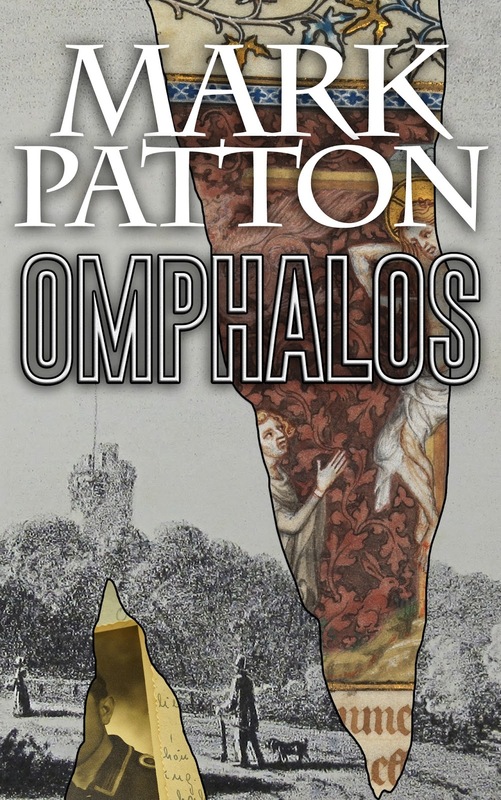 Normally without a book to read, he would move his head up and down so that the reflection of his face in the convex window opposite would develop panda eyes, elongate like an image in a fairground mirror and then pop. But this was not the day for such frivolity: he was on his way to buy the constituents of a bomb."